Dang, the luck. I will be out tomorrow afternoon to put some corn out. Anyone out there this morning? Not I. I'll hunt tomorrow evening. I may be out there tomorrow evening. Went and put corn out today. Nobody was there...but it was about 1400 when I was there. All 30 lbs of my corn is gone. That's a great sign. Luckily, I keep a bag stashed out here. Yes sir. They are all over mine too! 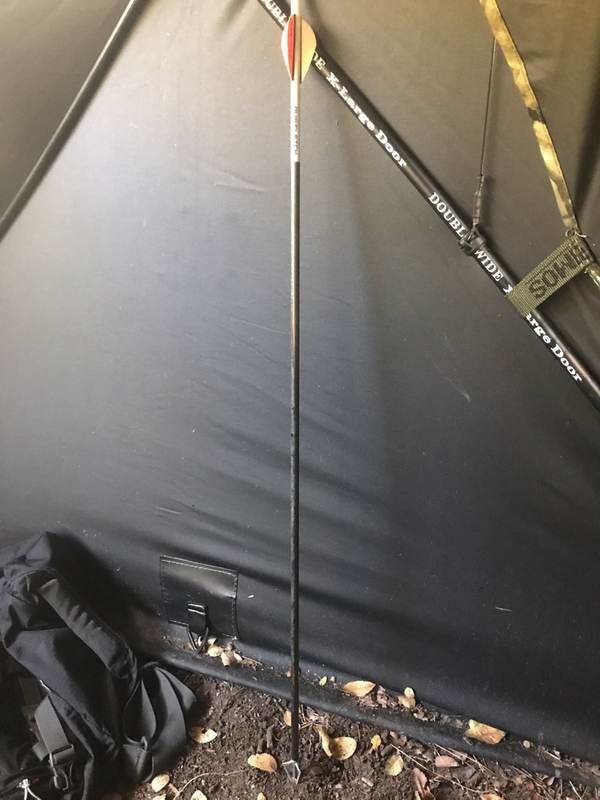 I put out 25lbs but didnt go out there today. I am hunting in the morning. I usually carry 6 or 7 pounds with me and put it out before I get in blind. Got a north wind. Not the ideal wind for my situation, but I'm in a ground blind covered in apple scent. Some one is target shooting behind me. Anyone got a contact for the GW who covers this area? Slow morning so far. Had a small buck come in at 0710. Nice cool morning! Hope they start moving soon. No sir. I will be back it in the morning and evening all they way till the 31st! Slow morning so far. But the wind is in my face. Nothing moving yet. 3 doe came in and they busted me. But i had my head down reading the Bible and looked up and there they were. I looked up too quick! Imma give them 30 minutes to come back but my back teeth are almost floating! Hoping this wind calms a little before dark! No kill but a good sit! Im in my stand at 15:30 sitting and waiting until the wind dies down, not expecting to see anything this evening. 19:00 i see a doe come in pretty quick with two fawns (probably twins), they eat a couple bites of corn 23 yards out. 19:05 Nice legal 8 point comes in 15 yards away and shows me the tail end until he gets to my corn, turns and i look at my pins to make sure they still have a glow. I look back up and buck is broadside at 22 yards and one of the fawns steps 3 yards closer between me and the 8 pointer leaving me with no shot. 19:13, 3 minutes of legal shoot time left, i draw and can faintly see my pin but i cant make out a good shot with a dark silhouette and tall grass behind the 8 pointer, so i let down my draw and watch him eat corn until 19:34. 4 hour sit is worth all 10 minutes of heart pounding! I think there was another buck with him i couldn't see because he would eat a couple of bites then turn around like he was keeping the other one away. He definitely did not mind the fawns and the doe. But he did not want whatever else was wanting to eat corn around. 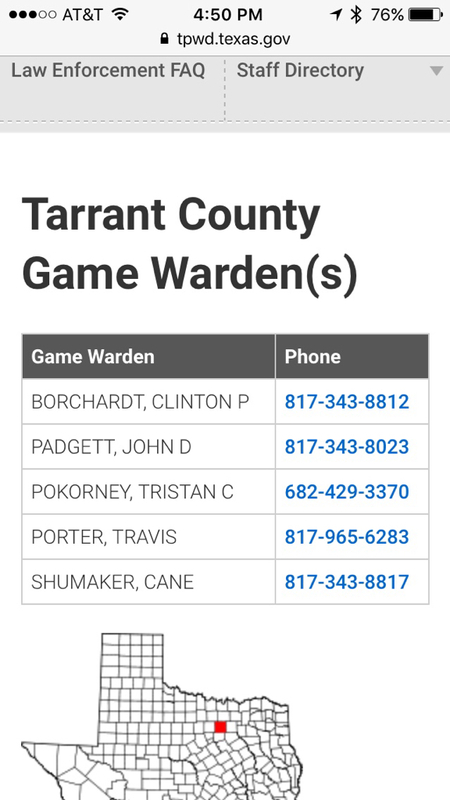 I hunted out there last year by the horse center and had the same thing happen. No fun sitting in a pop-up with bullets whizzing by. Police finally showed up and shut it down. Out here again. Lets hope I can get a shot this evening!!! Just got in my blind. 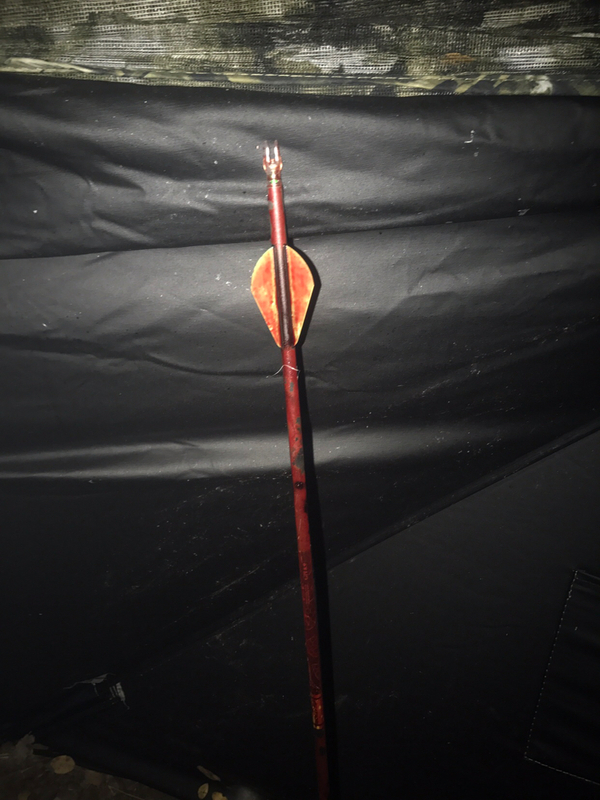 Somebody left me a present: a bloodied arrow. Thats no good! I got out here about 30 minutes ago. Wind is in my favor but its too much wind! Txt me if you shoot something. Back at ya. Think its gonna stay too windy. Doesn't look like you got very good penetration... I'd back out and call a dog. You gonna leave that for the guy that's hunting your blind? F5 f5 f5.... **** it come on with the detes! A little windy tomorrow but the weather should be good this weekend! Wish I had enough tags left to hunt. This is my first year hunting benbrook but I took a doe, turkey and a 200lb buck. Good luck to everyone! Big thanks to Texasgrown, Bowdude, and Topshot for Shari f the moment with me. Huge shout out to Topshot for putting me on some animals. Tell us more about this buck! And welcome to the campfire by the way, saw that was your very first post. Thanks! Had a few too many drinks Monday night and woke up late Tuesday morning so I didn't get into the stand until about 7:30, got busted by a small 4 point around 9 wind was really starting to pick up so I got down at 1 and headed to the truck and grabbed a quick snack. 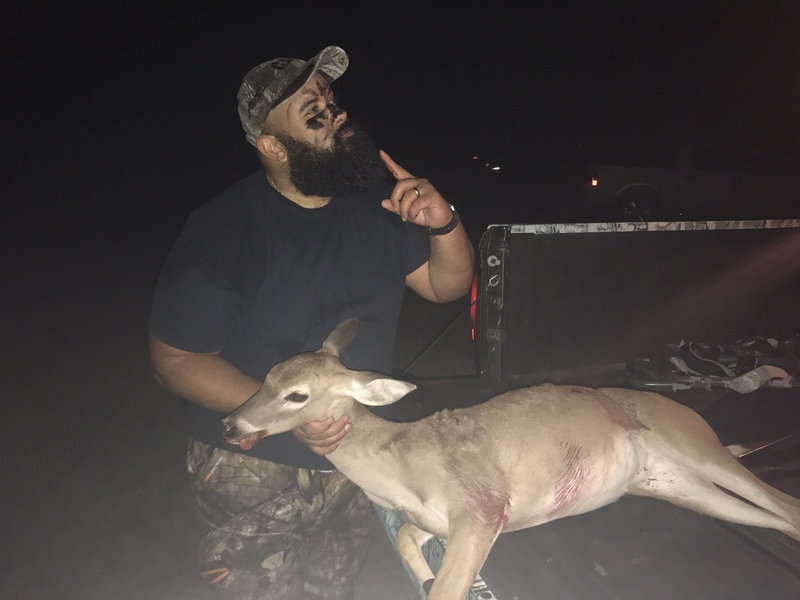 2:30 I decided to hunt a second spot that seemed promising, 3:30 a small 8 point comes out and eats corn for 30 mins, 4:30 a small 4 point comes out and does the same, 5:45 same small 8 point comes in along with the 4 and then a big spike comes in behind... the 8 point wasn't letting the spike come near and they clashed horns pretty good and he ran the spike off. Spike still lingered around for a bit while the other 2 ate for 15 mins or so before they all left. 6:30 the small 4 point is back with a different spike and they eat for about 10 mins and then wander off about 100-150 yards in front of me and I can still see them. 6:58 I see a deer coming towards me and I could tell he was a legal buck but he disappeared out of my view so I get ready. 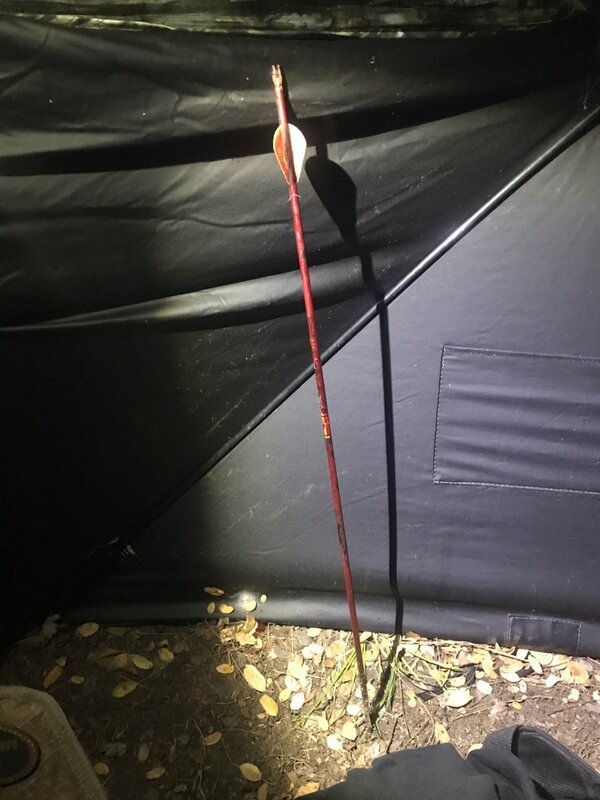 7:02 he steps in from of me broad side 15 yards, I didn't do a practice draw and my bow limb and elbow hit both sides of the pop up when I drew back, luckily I was able to release before he knew what happened. I nailed him good, he jumped a little trotted about 15 yards and started swaying and then walked about another 10 yards and I watched him lay over. Waited 20 mins and walked straight up to him, he isn't a monster but he's the biggest I've shot in my 6 years of hunting. 14 inches wide but really thick, only has one brow time so he's a 7 point, has trash around his base and 3 or 4 that could technically be considered points. Getting him out and into the truck solo was the biggest challenge! Processor called today and said without his head and skin he weighed 150 so I'm guessing he was atleast 200lbs. It was a hunt I'll never forget, he will be going on the wall! Awesome! Congrats, the Benbrook bucks are tough. There are a plenty out there, but the big ones are good at avoiding hunters. Post up some pics if you don't mind sharing. Phillip congrats on all the animals and the buck was heavy! Snack stick making before to long. Thanks Kenny! Hopefully I saved enough meat! Enjoying watching all the posts here. I finally got word that I was drawn for the last hunt in late January. I'll be chasing some ducks. Good luck to all you guys who still have time out there during deer season. I've yet to take a deer out of Benbrook but had a blast hunting it. Learned something new each time I went out. Great duck hunting out there. Is that him in yiur avatar? Notivmced missing brow. 10-4 on that! I've killed a ton of them out there over the years. Especially back when permits were on a first come, first serve basis (before the lottery). Congrats to the hunters on the deer. Congrats, beautiful buck! Harvesting bucks on pub land is truly a challenge and very rewarding!